P700 SHOWING TWO OF OUR DESIGNS: 23E AND 47 AS PANELS- SEWN INTO A BODICE TO CREATE A UNIQUE TOP. THE PANELS ARE EMBELLISHED WITH CRYSTALS. YOU CAN CREATE YOUR OWN DESIGNS FOR PANELS, OR YOU CAN USE ONE OF OUR DESIGNS. SELECT BY USING OUR CODES AND SPECIFY THE SHAPE WITH MEASUREMENTS. EMAIL US YOUR REQUEST. WE WILL DEVELOP THE PANELS WITH YOU. Your photo image should have a contrast to it's background so that the design is clearly seen on the print out. A fuzzy design will appear fuzzy on the fabric. Drawings or Illustrations in colour may be subject to variations when printing. See our colour pallet for reference. All our designs throughout website have used the same colours. Bright colours can be used but remember they vary from monitor to monitor and will vary slightly in the printing. A member of our team will work with you and you will see a sample for approval before printing. Delivery will be 4-6 weeks from time of approvals (depends on the complexity of your design). You may find it helpful to use one of our designs as a background. Don't forget to indicate the background colour. 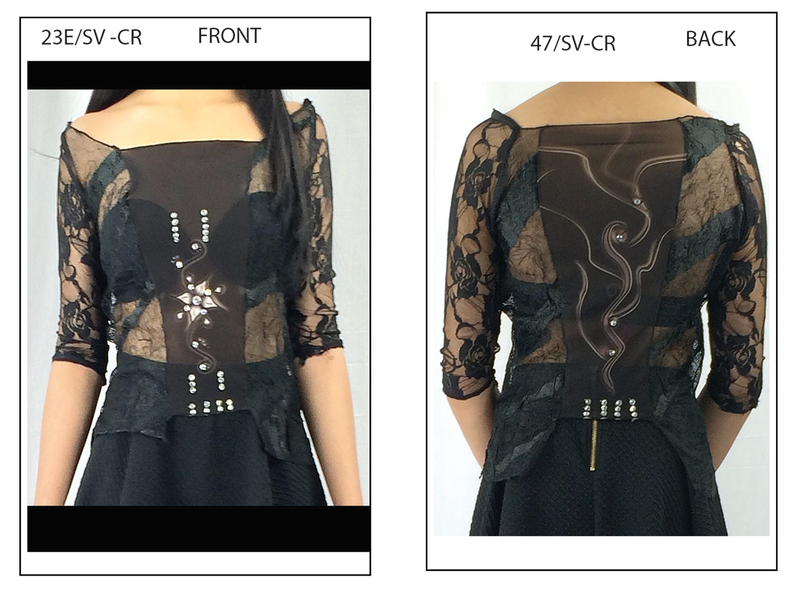 THE BELOW PRODUCT EXAMPLE IS NOT FOR SALE, IT IS A SAMPLE OF A PANEL INSERTED INTO THE BODICE. WE DEVELOP THE PANEL WITH YOU. Send us your design in PDF or JPEG format. Be specific in the size that you wish it to appear: length x width x height and add 5.8" seam allowace all around your shape. All personalized pieces are custom quoted. Let us know if we can post your design on our website, as reference only. Enjoy designing. © Copyright 2016 Tattoo Xchange. All Rights Reserved.